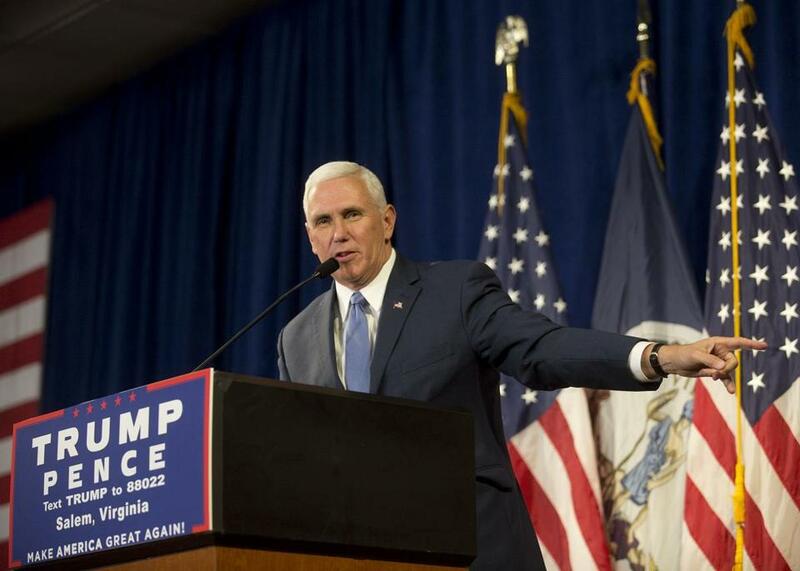 GOP vice presidential nominee Mike Pence, in a series of Sunday television interviews, sought to portray Republican criticism of the electoral process as relating entirely to what he described as unfair media coverage. WASHINGTON — Republican leaders and election officials from both parties on Sunday sought to combat claims by Donald Trump that the election is rigged against him, amid signs that Trump’s contention is eroding confidence in the vote and setting off talk of rebellion among his supporters. In a vivid illustration of how Trump is shattering American political norms, the Republican nominee is alleging that a conspiracy is underway between the media and the Democratic Party to commit vast election fraud. The governor, in Sunday television interviews, sought to portray Trump’s criticism of the electoral process as relating entirely to what he described as unfair media coverage. Trump’s words, though, appear to be having an effect on his supporters, and are setting off deep concern among civil rights groups. The Associated Press reported last month that only one-third of Republicans said they had a great deal of confidence that their votes would be counted fairly. And election officials are worried that Trump’s continued pressing of the issue could dampen turnout or cause his supporters to deny the legitimacy of the results if he loses. Jon A. Husted, secretary of state of Ohio, said it was “wrong and engaging in irresponsible rhetoric” for any candidate to question the integrity of elections without evidence. Husted, a Republican, said he would have no reason to hesitate to certify the results of the election. American elections are, unlike those in many democracies, largely decentralized, rendering the possibility of large-scale fraud extraordinarily unlikely. Further, the balloting in many of the hardest fought states will be overseen by Republican officials, individuals who would be highly unlikely to consent to helping Clinton rig the vote. Chris Ashby, a Republican election lawyer, said Trump’s attacks on the electoral process were unprecedented and risked creating a fiasco on Election Day. Ashby also said Trump was “destabilizing” the election by encouraging his supporters to deputize themselves as amateur poll monitors. Trump’s claims, a little more than three weeks before the election, are again forcing elected Republicans into a difficult spot as they try to balance offering assurances of the integrity of the election while not undercutting a standard-bearer many of their voters fervently support. Representatives of other Republican governors offered only a terse “yes” when asked if their state’s balloting would be conducted fairly. Yet other Republicans are appalled at Trump’s claims of widespread fraud, which are now a staple of his stump speech. “It is so irresponsible because what he’s doing really goes to the heart of our democracy,” said Trey Grayson, a Republican and former secretary of state of Kentucky. “What is great about America is that we change our leaders at the ballot box, not by bullets,” Grayson said. Still, Trump’s campaign surrogates have not hesitated to join him in questioning the fairness of the electoral process: Newt Gingrich, a former speaker of the House, and former mayor Rudolph Giuliani of New York, both advisers to Trump, used television interviews on Sunday to suggest that Democrats tend to cheat in elections, accusing them of counting votes from dead people. Civil rights groups have begun to express alarm at remarks from Trump that they see as goading his supporters to intimidate minorities at the polls. Arturo Vargas, executive director of the National Association of Latino Elected Officials Education Fund, said he planned to formally contact the Justice Department as soon as this week, to ask that it guard against the kind of voting disruptions Trump has encouraged.